The following names are from the Dergholm & District WW2 Honour Roll in the Dergholm & District Soldiers' Memorial Hall (near Casterton in south-west Victoria, Australia). The additional information column is an attempt to identify the individuals named on the Honour Roll. 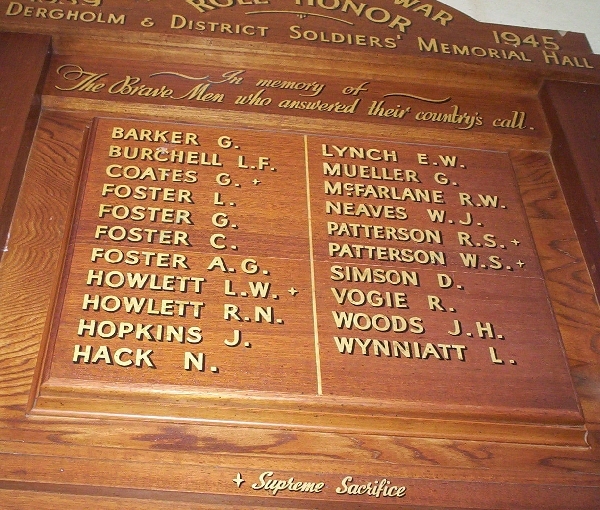 Named on the Dergholm & District Soldiers' Memorial Hall Honour Roll. BURCHELL, L. F. Leslie Frederick BURCHELL, b. 1912, Sandford, Victoria, son of John Henry BURCHELL & Joanna Maria Hill Fenwick MARSH and living at Dunrobin when he enlisted in 1941. + COATES, G. George Duncan COATES, b. 1915, Gunbower, Victoria, son of William Henry COATES and Elsie Victoria RADNELL. Died from illness in the South-West Pacific. Named on the Casterton War Memorial, Casterton Town Hall Honour Roll, Cohuna Honour Roll, Dergholm & District Soldiers' Memorial Hall Honour Roll, Dergholm Recreational Reserve Memorial Plaque & Tree. FOSTER, L. Lawrence John FOSTER, b. 1926, Casterton, son Ernest John FOSTER and Mary Elizabeth STARK. FOSTER, C. Appears to be Charles James Hepburn FOSTER, b. 1894, Casterton, Victoria, son of Thomas Hayford Lexington FOSTER and Margaret McCALMAN. Served in WW1 at Galipolli & France. Served in WW2 with the Royal Australian Engineers. FOSTER, A. G. Aubrey Glenelg FOSTER, b. 1910, Casterton, Victoria, son of William FOSTER and Frances Harriet FOSTER. HOPKINS, J. John Foster HOPKINS, b. 1921, Hamilton, Victoria, son of Leonard Walter HOPKINS and ___ and living at Dergholm at the time of enlistment in 1942. + HOWLETT, L. W. Lancelot "Lance" Wilfred HOWLETT, b. 1919, Casterton, Victoria, son of Wilfred Lockart HOWLETT and Elsie Eliza SMITH. Served with the 2/22nd Battalion on Rabaul and died as a Prisoner of War with the sinking of the "Montevideo Maru" on 1 Jul 1942 in the South-West Pacific. Named on the Casterton War Memorial, Casterton Town Hall Honour Roll, Dergholm & District Soldiers' Memorial Hall Honour Roll, Dergholm Recreational Reserve Memorial Plaque & Tree. HOWLETT, R. N. Russell Mervyn HOWLETT, b. 1917, Casterton, Victoria, son of Wilfred Lockart HOWLETT and Elsie Eliza SMITH. Served with the 2/22nd Battalion. Named on the Casterton War Memorial, Casterton Town Hall Honour Roll, Dergholm & District Soldiers' Memorial Hall Honour Roll. HACK, N. Norman Ian HACK, b. 1914, Casterton, Victoria, son of Theodore William HACK and Mary Elizabeth FERGUSON, living at Poolaijelo when he enlisted in 1942. MUELLER, G. George Colin MUELLER, b. 1910, Mount Pleasant, South Australia, daughter of Hermann Frederick MUELLER and Florence Emily WOODIFIELD. Enlisted in the RAAF in 1942 when living in the Casterton area. Married Mary Robina FERGUSON and both are buried in the Dergholm Cemetery. McFARLANE, R. W. Roland William McFARLANE, b. 1914, Hamilton, Victoria, son of Malcolm William McFARLANE and Margaret FITZGIBBON. Enlisted in 1942 and served with the 24th Battalion. NEAVES, W. J. William James NEAVE, b. 1912, Casterton, Victoria, son of James George NEAVE and Annie McLEAN. Served with the 2/22nd Battalion on Rabaul and escaped after the Japanese invasion and later served with the 2/4th Battalion. + PATTERSON, R. S. Richard Stuart PATTERSON, b. 1909 "Brung Brungle Station" near the Wannon, son of Hugh PATTERSON and Grangie Stuart RAMSDEN. Recorded as a Grazier of Casterton in 1841 when he enlisted in the RAAF and was killed in a training accident near Bairnsdale, Victoria. + PATTERSON, W. S. William Stuart PATTERSON, b. 1911 Casterton, Victoria, son of Hugh PATTERSON and Grangie Stuart RAMSDEN. Recorded as being from "Caupaul Station" when he enlisted in the AIF. Captured after the Japenese invasion of Rabaul. Presumed lost at sea on the "Montevideo Maru" as a Prisoner of War in 1942 as Sgt VX20713 1 Independent Company. SIMSON, D. Appears to be Charles Eric Douglas SIMSON, b. 1916, Geelong, Victoria, son of Charles Eric Playfair SIMSON and Ada Gladys HALL of Roseneath. He served in WW2 as Cpl VX28195, 2/8 Aust Light Anti Aircraft, Battery. WYNNIATT, L. Leslie Clarence WYNNIAT, b. 1920, Edenhope, Victoria, son of Clarence Gladstone WYNNIAT and Ethel May HARMAN. His residence was recorded as Power's Creek, near Dergholm when he enlisted in the AIF in 1941. Leslie was married to Margaret Shirley BURRELL and they are both buried in the Casterton Cemetery.